Sub-regional Conference on promotion of the two Conventions on the “Protection of Cultural Property in the Event of Armed Conflict” (1954) and on the “Means of Prohibiting and Preventing the Illicit Import, Export and Transfer of Ownership of Cultural Property” (1970) was held in Almaty, Republic of Kazakhstan on 27-28 June, 2017. Objectives of the meeting included: Development and enhancement of the national capacities in implementation of the above-mentioned conventions; Strengthening the efficiency of the national and sub-regional cooperation in the implementation of the above-mentioned standard-setting instruments; Introduction to the global strategic and forward looking directions. Speakers and experts from the International Committee of the Red Cross, International Criminal Court, World Customs Organization and UNESCO Headquarters delivered the key presentations during the conference sessions. 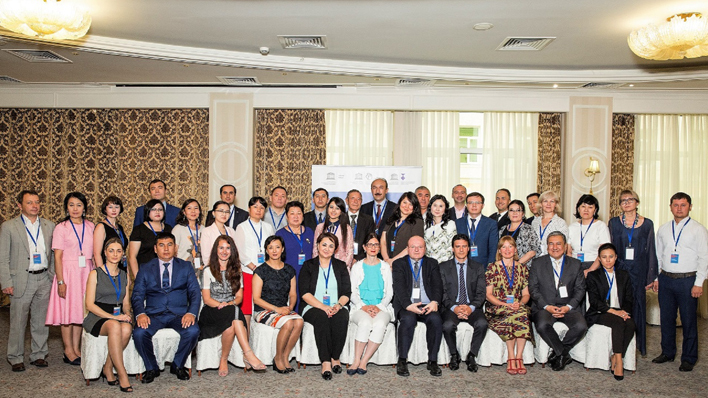 Representatives of Ministries of Culture, Internal Affairs, Justice and Defense, specialists from the National Commissions for UNESCO, museum staff and customs officers from Central Asian countries – Kazakhstan, Kyrgyzstan, Tajikistan, Uzbekistan participated in the work and discussions of the conference. In the welcome speech during the opening session, Ms. Krista Pikkat, Director of the UNESCO Almaty Cluster Office, highlighted the issues of effective protection of cultural properties that became more relevant in our society these days, especially during the armed conflicts in some parts of the world that directly or indirectly connected with the destruction of cultural heritage. Ms. Pikkat also noted that though the Central Asian countries were not involved directly in the conflicts, they could serve as the transit area for illicit export of cultural assets. Issues of restitution of historical-cultural assets and others. The majority of delegates noted the professionalism of the high-level international speakers, the relevance of the topics discussed and stressed that in general the conference met their expectations. 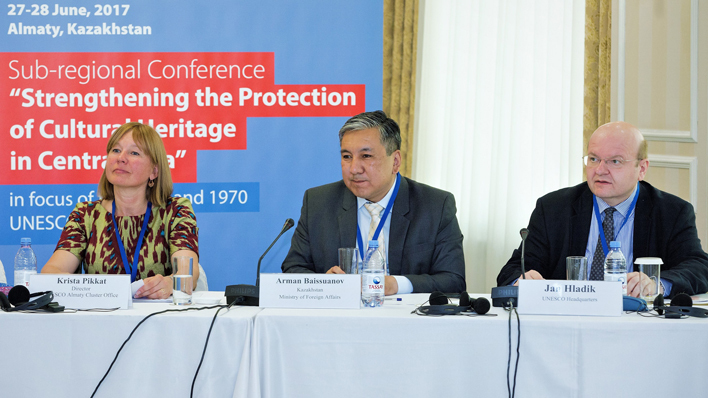 The participants of the conference proposed some recommendations on strengthening measures to protect cultural heritage both at the national and Central Asian levels, in particular to continue to raise awareness and capacity of representatives of government bodies directly related to the implementation of these Conventions, as well as museum staff. Particularly, country delegates noted the need to raise awareness among a wide range of population and youth, through the development and dissemination of various materials and publications, and development of video materials. Important for all countries and the entire international community was the adoption in March 2017 of a historic resolution of the UN Security Council on the protection of the heritage in the event of armed conflicts. It was the first ever UN Security Council resolution aimed at protecting cultural heritage. The unanimous support of this resolution reflects the recognition of the importance of protecting the heritage in order to maintain peace and security in the world.